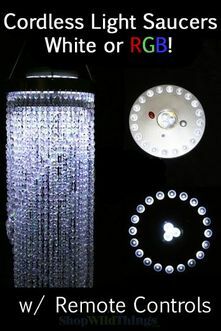 Change the look of any event with our premium LED light discs from ShopWildThings. Make elegant chandeliers spectacular, pretty floral arrangements a work of art or a simple centerpiece your signature masterpiece. You won't have to look for power outlets with our awesome battery-operated LED light discs. Our delightful how-to videos demonstrate how easy it is to install inside or at the top of chandeliers. Choose pure white or soft white light discs. Browse our color-changing LED light discs with remote controls to change the room's colors and mood with a touch of your finger. Enjoy the eco-friendly advantage of LED lamps that last thousands of hours longer than standard bulbs. Create uplighting from beneath flower vases. Let your imagination soar with our submersible LED light discs for use in ponds, pools or tall glass vases. Drop them into bowls filled with acrylic crystal beads or our colorful water jelly pearls. Our expert staff is eager to help you find the right size in LED lighting, chandeliers, centerpiece décor and backdrop beaded curtains. Shipping is fast and free on qualifying orders.